It can be fitted along with a sport catalyser. Our exhausts all fit onto the original interfaces. By this we mean their entry, their outlet and their size are the same as those of the original part. 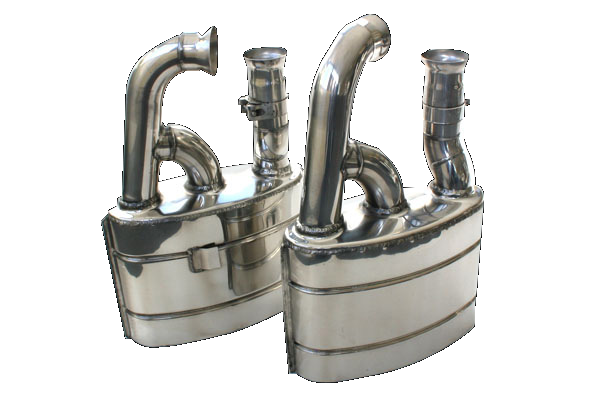 These mufflers fit straight onto the catalytic converters. On average it takes about 2 hours to fit, including the time it takes to remove the original exhaust. It will be faster if the exhaust you're removing is in good condition, just as it may take longer if the reverse is true. There is no need to remove the rear bumper. However, you will need to use a car hoist as the mufflers need to be removed from underneath. Remember that the bolts must always be tightened progressively across the whole set of bolts. To ensure that our exhausts are fitted under the best conditions, a mounting kit containing: stainless steel bolts, stainless steel lock nuts and high temperature copper grease, is included with your exhaust. If your original muffler was Gillet style, you will need to contact Porsche and order 2 olive ring gaskets and 2 clamps for Bischoff mufflers. We recommend that you use the copper grease on the thread of the bolts and in the gaskets at both ends of the muffler when fitting.